Having problem installing the Scripts? Installation doesn’t seem to be an easy task for many of us here. In spite of having the downloads ready, you might still not be able to use the script, just due to the Installation errors you encounter. Is Installation procedure annoying you? Are you spending your time and energy in fixing these installation issues? Device capacity not enough to match the App file size while installing. Troubled connecting your installation script to the database. Facing issues while granting permission to the directory for installation. Configuring the files before installation seems to be tough. Confused on seeing the packages while Installing. 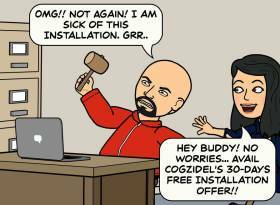 Here comes a surprising offer from Cogzidel to put an end to all your Installation issues. Cogzidel is celebrating the Customer Service Month and is delighted to offer Free Installation for all the downloaded scripts. Connect with us, and avail the FREE INSTALLATION offer. This is a great opportunity to install your downloaded Scripts for free. Grab it now. Offer available only for the next 30 days! Click the link to avail the Free offer. *We also help you in installing third party scripts for a small fee of $49. Next Entry Can You Manage Sales? !